Peter Drucker once said that “the only profit center is the customer.” The satisfaction of your clients determines the success of your business, which is why it’s important to plan your client experience and track your performance. Understanding the impact and quality of each of your client touch-points is key to boosting client satisfaction and in turn increasing your profits. 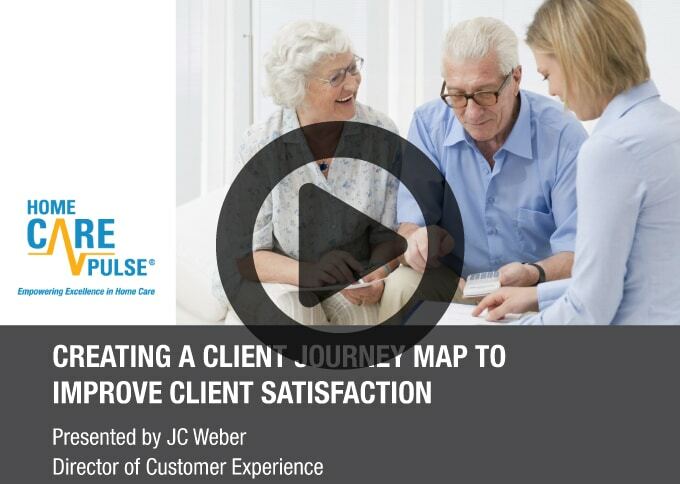 Join Home Care Pulse Director of Customer Experience, JC Weber, to discuss why every provider needs a client journey map. Learn how to engage your team in client satisfaction, and understand three key metrics you can improve by creating a client journey map—client average length of service, client lifetime value, and Net Promoter Score.